ModEva™ is the new modular and evolutionary design proposed by Cybelec® for its numerical control applications. ModEva™ is a RANGE of numerical controls adapted to the actual market demand. Therefore the complete ModEva serie runs now under Windows™. The modularity of the new ModEva™ design means that Cybelec® is able to meet every personalised demand on the market. While still taking as its base a 19" double European industrial card rack system that has proven its worth in upscale systems, Cybelec® has again increased the modularity of its systems. Indeed, in addition to the choice of the number of axes and I/Os, Cybelec® has taken flexibility to the N th degree by modulating the POWER of the main processor. 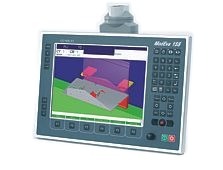 Hence, although ModEva™ can provide a calculating capacity and performance adapted to simple machinery with a 2D graphic display, it can also be transformed into a real workstation with a very high-power CPU and maximum graphic capabilities thus making Cybelec® adapted numerical control available to the most sophisticated machinery. The use of the ETX board eliminates virtually all wire connections between our components. This means all active components (like boards, power supply, etc) are pluggable in the 19" professional rack. This gives a much higher reliability than a wired equipment, as well as a simple possibility to exchange boards in case of necessity, even by the owner of the machine himself. Indeed, since joining the Infranor® Group, Cybelec® can offer not only motors and servo-amplifiers but can develop both the most effective solutions and those best adapted to the demands of each of its customers. 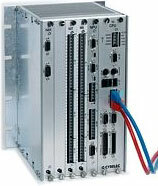 In order to make ModEva™ succeed, Cybelec® developed the remote numeric control console principle. 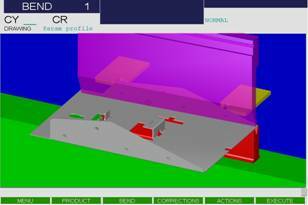 To be able to offer modularity, Cybelec® opted to make the consoles independent of the CNC itself. This makes for a great freedom of choice of its user interface. This remote console design is based on the Cybelec® Panel Link (CPL) technology that connects the console to the electric cabinet by just two standard (RJ45) cables so that Cybelec® ModEva™ consoles can be placed more than 10 metres from the actual numerical control. All ModEva™ consoles are equipped with the new Quick Cursor™ device. Quick Cursor™ is a rotary button for rapidly and comfortably moving the cursor over the pages and for opening and selecting options in a menu. The change of pages and movement of axes in manual mode are also made possible with the same button. This greatly improves the ergonomics of numerical control. At the graphic interface level, the ModEva™ range allies the recognised efficiency of CYBELEC® with great simplicity of use supported by very intuitive programming. 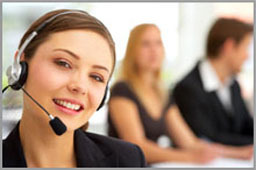 One of its main features is the possibility of completely programming a part on a single page. For example, the average time to set up a triple-fold component, ready to be performed, is thus reduced to about thirty seconds. When producing more complex parts, the graphic sequences generated by a CAD/CAM system can easily be viewed on the user console. And then there is the fact that, in close co-operation with the main suppliers of CAD/CAM systems, CYBELEC®, thanks to its openness, offers access to the simpliest as well as the most powerful of sheet metal modelling systems, as well as to software specialised in the interpretation of 2D or 3D files or those that offer a complete simulation. They can all transfer their results to the CYBELEC® numeric controls in a very simple and user-friendly manner with a maximum of automation. An electronic angle protractor connected to the ModEva allows to transmit the measured value directly to the numerical control which calculates immediately the correction. This makes the adjustments quicker and reliable. The transfer command is made by a button on the device or by a small pedal connected to the RS232 interface. This mode requires only one measurement per angle (generally in the middle of the bending length). A measurement is carried out at each of the two extremities (or elsewhere) of the bend. PC 1200 program allows you to prepare your programs, calculate offers, check feasability of the parts in your office on a PC. No time waisted on the machine.